Sea turtles are used to a challenge. Only 1 in 1,000 hatched babies survive to adulthood once they’re in the ocean. From there, they are exposed to multiple threats including deaths from accidental entanglement in fishing gear, destruction of nesting beach habitat, and legal and illegal harvest of adults and eggs. Climate change impacts loom as well. As a result, populations overall have been reduced by approximately 95 percent from original levels. 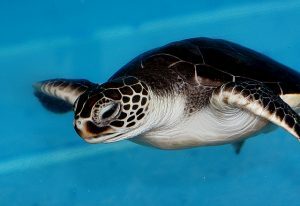 Historically, one of the biggest threats to sea turtles was direct harvest of eggs and adult turtles for food, which increased steadily until international trade of most species of sea turtles or their eggs became illegal in 1981 under the Convention of the International Trade in Endangered Species (CITES). CITES and ESA protection have significantly reduced sea turtle deaths over the years. The commercial fishing industry has posed a critical threat to sea turtles. Kemp’s ridleys were especially hard hit, caught and drowning in fishing nets in the Gulf of Mexico. 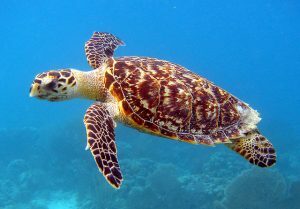 In the 1990s, EDF worked with fishermen and managers to develop and adopt gear modifications that have significantly reduced turtle mortality. These gear modifications included turtle excluder devices (TEDs) – specialized nets that work by releasing larger marine organisms through a trap door, while still collecting shrimp. 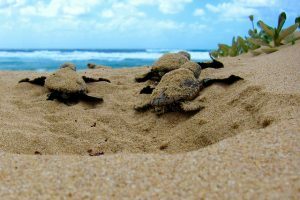 TEDs have helped to lessen sea turtle casualties, while careful husbandry of hatchlings on nesting beaches have helped enhance reproductive success. Thanks to effective policy protections and fishing innovations, there has been a marked improvement in some sea turtle populations. In some places, green turtle populations are nesting in record numbers. Hawksbills have reappeared in Honduras, El Salvador and Nicaragua. Leatherback numbers are increasing in some places. A recent study shows that globally, where data are adequate to detect trends, increasing nesting populations exceed decreasing nesting populations. The health of many sea turtle populations remains unclear. Nonetheless, this comeback is promising, not just for turtles, but also for marine ecosystems and the marine economy at large. Sea turtles are essential elements in coral reef, sea grass and mangrove ecosystems. Turtles help maintain sea grass beds, which also provide habitat and nurseries for a wide variety of fish and crustaceans that are harvested for human consumption and support large fishing economies. On beach and dune ecosystems, sea turtle eggs provide otherwise limited nutrients – from unhatched eggs or leftover shells – that improve vegetation growth. Sea turtles also offer a number of opportunities for people – locals and tourists, children and adults – to learn more about wildlife and the ocean. From North Carolina to Florida and around the Gulf, people frequently participate in night watches on beaches, hoping to spot turtles crawling ashore to lay eggs, or baby sea turtles hatching and scrambling towards the sea. It’s inspiring to see these creatures and to know that citizens are doing what they can to help protect these vulnerable populations. With a winning combination of smart policies, industry action and citizen interest, the incipient sea turtle success story is one that should continue to instill pride in the policymakers, fishermen, and individuals who are working together to help save these delicate, ancient, and iconic species. This blog was co-authored by Doug Rader, Chief Oceans Scientist at EDF. This entry was posted in ecosystems, Endangered Species Act, Wildlife Protection and tagged endangered species, Endangered Species Act, endangered species act success stories, fishermen, green sea turtle, hawksbill sea turtle, kemp's ridley sea turtle, leatherback sea turtle, loggerhead sea turtle, olive ridley sea turtle, sea turtles, wildlife. Bookmark the permalink. Both comments and trackbacks are currently closed.